Did You Know That Painting Can Help You Relax, Relieve Stress & Soothe Your Soul? Looking for a watercolor pens set that will allow you to create your own magnificent watercolor paintings? Need a beautiful gift idea for your son, daughter or grandkids? Want to discover the magical world of arts and spend moments of relaxation at home? Presenting The Ultimate 24 Watercolor Brush Pens, Waterbrush & Painting Pad Set By Artaso! Now you can unleash your inner talent and possibly become the next Van Gogh, Eliot O'Hara or James McNeill Whistler with the Artaso premium watercolor pens brush set, which is the ultimate starter's pack for adults and children who want to explore their talent. Why Choose The Artaso Water Pens Kit? Discover A New Hobby - painting will not only help you deal with anxiety and stress, but it will also help spark your imagination and creativity. Spoil Your Children - if you are looking for a thoughtful present for your child, our painting kit will help keep your child off smartphones and social media. Everything You Need Is Here - including 24 amazing brush pens, 1 blending brush and a watercolor pad. You can start painting right away! If you are not 100% satisfied, we will buy it back from you at full price! 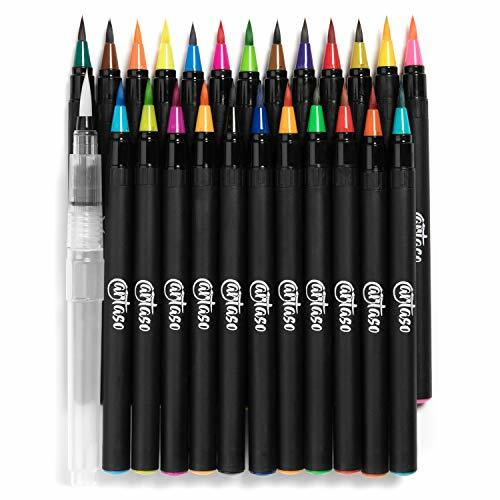 Click "Add To Cart" & Get Your Watercolor Pens Set Before We Run Out Of Stock... Again! UNLEASH YOUR INNER CREATIVITY WITH THE ULTIMATE WATERCOLOR SET, which includes everything you need to paint the most amazing water color paintings. Our water pens set includes 24 x vibrant colors, 1 x waterbrush for blending and a high-quality 15-page watercolor pad to get you started! SPARK YOUR ARTISTIC IMAGINATION WITH OUR WATER COLOR PAINTING KIT and offer your son, daughter, nephew, niece or grandchildren the most thoughtful birthday, Christmas or holiday present. Easily craft and create incredible paintings, blend colors and dive into the magical world of arts. 100% SATISFACTION OR YOUR MONEY BACK! That's our unconditional guarantee! If you are not 100% thrilled with your watercolor brush pens set, we promise to offer you a prompt and full refund. No questions asked. What are you waiting for? Bring out your inner Van Gogh now 100% RISK-FREE! UNLIKE ALL THOSE LOW-QUALITY WATERCOLOR BRUSH PENS SETS that include only 20 colors or even less and feature cheaply-made brushes, the Artaso water color brush pens set includes 24 premium-quality eye-catching colors and a ultra-soft and flexible brush for blending colors. THE ARTIST-APPROVED WATER COLOR MARKERS SET IS HERE! Stop worrying about messy accidents and watercolored shirts, since our exclusive water colors are not only 100% washable, but also non-toxic, odorless and skin-safe. Washing the colors off will be a breeze and you will spend less time cleaning and more time painting. If you have any questions about this product by Artaso, contact us by completing and submitting the form below. If you are looking for a specif part number, please include it with your message.